Meet Ryan Dowdall. Words can’t describe how much he loves to play guitar and his passion for music. Growing up in a house with music in the air all the time, he heard the calling early on. When he was 13, his dad brought home a Led Zeppelin DVD and he saw Jimmy Page dancing around in bellbottoms, guitar strung low, sweat Flying everywhere and knew that was what he wanted to do. Growing up as a child, Ryans’s parents would often put a small cassette player underneath his pillow at night to help Ryan fall asleep. The soundtrack to his dreams would be anything from Celtic, Classical, and Jazz to Rock. One day when he was 13, he went over to a friend’s house and his friend showed him how to play “Smoke On the Water.” He went home picked up an old right handed electric guitar and learned it. For his 14th birthday his parents bought him a right-handed red Fender Strat starter pack. An interesting thing about Ryan is that he is left-handed, but his First guitar was right handed. He was so eager to play that he just played it strung upside down. Ryan started learning more and more guitar licks and soon he was playing full lead lines from Randy Rhoads and Eric Johnson from memory but soon realized he would need to switch from right to left handed guitar in order to go where he wanted to on the fretboard to express himself. 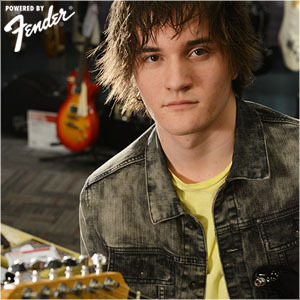 He then purchased a left handed guitar, started all over, and re-taught himself to play left-handed when he was 15. As for the near future Ryan is committed to follow his calling and dreams. He continues to write, record, and play around the Philly area. He has his sites set next on Nashville. 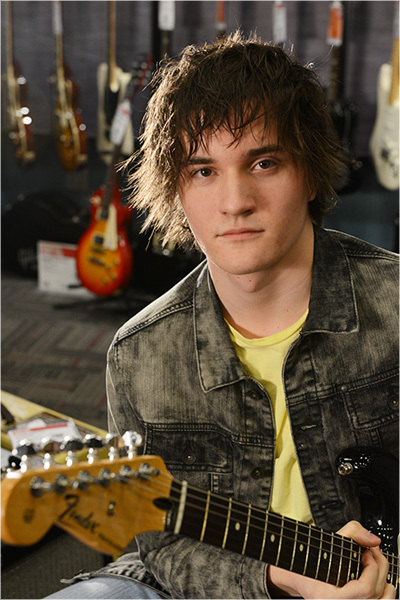 “I really wanna start a band and have that bond that I see in other bands I look up to where four or Five guys know everything about each other and are great musicians.” Ryan tells Robert Knight in his recent interview at Guitar Center in Wilmington, Delaware. Most recently Ryan has had the privelage of jamming with fellow Brotherhood player Nick Cianci at World Café Live in Philly as well as opening for guitar great Arlen Roth. He is working hard at honing his licks, writing and recording while getting ready to show the world what he has to offer to this new generation of music followers. Stay tuned…he is just getting started.